Whatever it might be called, there's a flurry of activity at the intersection of futures and design. After many years of quiet gestation in mostly isolated pockets, and of bringing these ideas to the attention of countless previously uninitiated groups, it's exciting to find a growing number of folks experimenting and enthused; an increasingly networked awareness and momentum; a sense of emerging community. At these events we often also find some amount of grappling with terminology and framing, which takes me to how these areas have evolved over the dozen years since we started working in this space –– before we had so many instances to think with, let alone a vocabulary for it. I'm reminded of an exchange from 02012, when futurist Trevor Haldenby interviewed me via email as part of his Master of Design research project at OCAD University, with the working title 'Transmedia Narratives and Experiential Scenarios'. Our interview covered several topics that remain relevant, and seem useful to share given the growing interest in these spaces. A little context for the (lightly edited, links added) exchange below: this was the same year that Trevor and collaborators founded The Mission Business, with the focus of his MDes project – the final version is here – being their groundbreaking interactive theatre campaign ZED.TO. I didn't yet know that my next step would be to Toronto for a professorship at OCAD; at the time I was still heading up Foresight and Innovation for Arup in Australasia. The end of 02012 was two and a half years after The Futures of Everyday Life, and a year before Tony Dunne and Fiona Raby published Speculative Everything, at which point the frame of 'speculative design' really started entering currency. TH: How do you refer to your work? What is the history of the term? 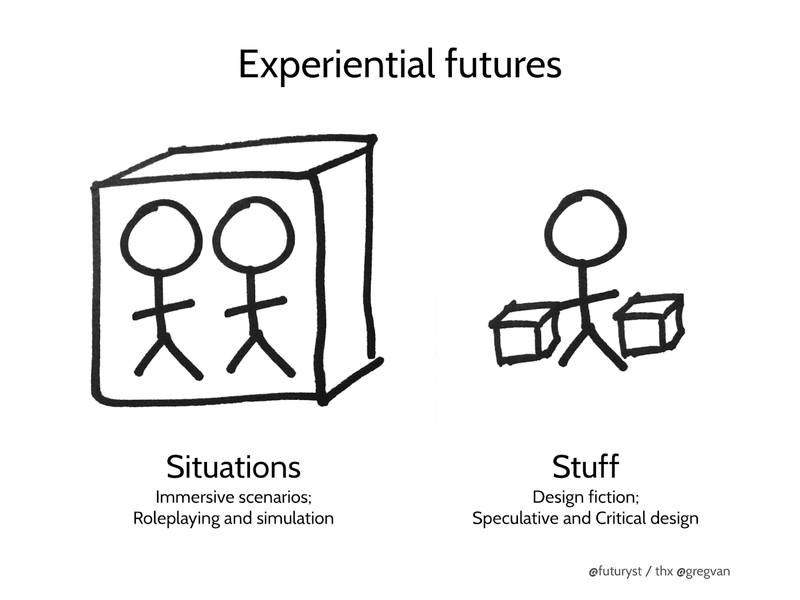 SC: I most often use the terms experiential futures and experiential scenarios. The former refers to the whole area of practice, as a methodology. The latter refers to particular projects or interventions based on specific stories. They bear a very similar relation to one another as do the terms sans 'experiential'; i.e., the second is a subset of the first. There are plenty of cognate terms currently floating in the same semantic cloud. The term 'tangible futures' is useful because it's intuitive. 'Immersive futures' also. 'Critical design' seems mainly to be about stretching the intellectual legitimacy and contributions of design, a worthwhile aspiration that is associated with some very interesting work (Dunne & Raby and their protégés). 'Design fiction' turns out to be a semantic honeypot luring design-minded folk into a worthy mode of experimentation, combining speculative story with a designerly interface to materiality; although to date, in practice it has been excessively tech- and object-focused. It has also by and large not yet escaped the techy subject-matter preoccupations of its cousin, science-fiction prototyping. The scope of futures needs to be far wider than gadgetry; the rub's in the manifold rippling consequences of change, especially in the complex ineffable and multifarious nontechnical facets of life as we experience it. Imaginings that start with technical objects seem too easily also to end there, indulging a desire to oversimplify, so I suggest there's a reductive thinking here that we need to challenge ourselves to surpass. In any case for that narrower purpose, the evocative (if bulky) term 'artifacts from the future', borrowed from Wired magazine, is the one I tend to use. There are also such polysyllabic options as 'object-oriented futuring' and 'diegetic prototyping', the former I've written about a bit and the latter having been picked up from David Kirby by #defi boffins Julian Bleecker and Bruce Sterling. To my mind, all of the above have their place while being less encompassing than 'experiential futures', which I prefer because a nascent practice - which is what I think this was when I was writing my doctorate on the subject; and in many ways still is - needs an overarching conceptual frame pulling it together. The reference to experience is a deliberate choice of an accommodating substrate or canvas incorporating designed objects, encounters in the flesh, etc. (I also appreciate and sometimes use other design terms like 'interaction design' and, even if it's much less common, 'situation design'.) But the choice of 'experience' is meant to include basically anything that you as a futures practitioner, artist or agent provocateur can cause or catalyse. It applies equally well to an object in hand, an advertisement in the newspaper, a role-playing game, a documentary snippet from the future, and more. I don't know when I started using the term experiential futures but it would probably have been in conversations with collaborator Jake Dunagan in around mid-02006, and then 'thinking aloud' at my blog, as those ideas developed. It was in fact the blog's tag cloud that progressively (and somewhat to my surprise) demonstrated that my set of interests were gravitating towards art and design. A 02009 guide to communicating climate change for laypersons included the term 'experiential scenarios' as a key communicative strategy for simultaneously addressing both heart and mind, and yet oddly that guide neither explained the term nor provided any examples of it in action. Which suggested to me that this was an intuitive enough concept to resonate, but one without a lot of substance or examples assembled behind it as yet, so reinforcing a leaning towards using it as a master concept in my dissertation and elsewhere. Who are you trying to reach with your work? Who is your intended audience? Broadly I am interested in experiential futures as a way of addressing the culture at large. It is time to make deeper, more visceral and grounded thoughts and feelings about possible futures accessible to audiences wider than those that most traditional futures work has aimed or managed to reach. That said, the answer really depends on the project. In a client relationship the client is generally the key audience (unless they are hiring you to try to reach some other constituency, and even then…). An intrapreneurial situation, ie where one is an internal change agent for a large organization, can probably be thought of as a special subset of the client-type relationship. For those more 'public' projects with broad access and impact as a goal, there might be a vaguer answer – 'whoever's open-minded or ready enough to notice'. In any event as the above suggests it may be useful to recognise that for any project there's often more than one audience, and by this I don't refer only to the obviously variable demo- and psychographics of individuals on the receiving end, but rather to contexts of encounter. E.g. In the case of guerrilla futures interventions, there are primary and secondary audiences (e.g. see The Futures of Everyday Life p. 245). The secondary audience, who hears about it later rather than experiencing it first hand, will likely be affected in quite a different way. It's not the direct experience, but the 'story of the story', so to speak, which can reach a much wider audience and thus indirectly propagate ideas about the future well beyond the experiential encounter. Also note that a big difference exists between an expected/solicited and unsolicited/unscripted encounter. My 'favourite' audience, or the context of encounter that I find most interesting, is probably the audience of the guerrilla futures intervention, i.e., those who stumble across an unsolicited experiential scenario. This is because it is both the largest and least thought about, and so seems at this point to harbour the greatest untapped potential. What effect do you hope your work will have on them? In terms of the classic trio of possible, probable and preferable futures (popularised in and usually attributed to Amara's 01981 trio of articles, although it appeared in Toffler's Future Shock more than a decade before), the most basic, 101-level intervention is to challenge people's sense of the bounds of the possible. To catalyse or kindle within someone an inquiry into their own understandings about the future – what they consider to be possible, probable or preferable within the system in question – is the goal. To pluralise their perception of what can be, and nudge them towards questioning and then acting into the future(s) they prefer. A futures-activated person develops an optimism of the will (to borrow Gramsci's term from another context) as opposed to optimism of expectation. It is about engagement with possibility and rather than passive acceptance of 'the future' provided by their cultural context (whatever it may be). I don't presume that a single work or encounter can do that alone, but that's the current or course of development, individual and cultural, to which I'd like to contribute. Could you describe the design process associated with your work? I have done a brief diagram of it before (dissertation p. 170) but the reality is not necessarily as neat – a clean conceptual description is inevitably part wishful thinking. The goal of the process is to put people in circumstances whereby they're invited and enabled to think and feel into the potential and implications of a putative reality that does not (yet) exist. They do not have to buy it hook, line and sinker; the point is more commonly to invite them to test it out. So, creating those circumstances means alternating between the conceptualisation of your creation at several levels of abstraction: the logic of the scenario, and the accessibility and comprehensibility of the experience provided (part of which is furnished by the context of the encounter which you may not be able to fully control, but which you can certainly try to co-opt). Aspects of this process are captured well by a phrase of futurist Riel Miller which he uses to describe scenario production: 'rigorous imagining'. The rigour that you need to bring to the imagining is increased when you're trying to manifest it palpably in experience, rather than leaving it in the splendid abstractions of text or statistics, which are the most common modes of scenaric representation. When Jake Dunagan and I ran an experiential scenario co-creation process over three days for the Emerge event (at Arizona State University in March 02012), we used a typology of subject (theme), story (narrative and genre), situation (concrete experience, medium and encounter). By necessity this was hastily distilled for the event, based on six or more years of working together on similar projects over more generous timelines. We basically prepared a subject in advance: the experience was to be about a disruptive archaeological discovery in Phoenix, to do with the disappearance of the region's pre-Columbian inhabitants. We also had the rudiments of a situation organised; having secured permissions from the university to set up a (supposed) archeological dig on campus, in which some kind of monumental artifact (deliberately TBD) would be unearthed, and then turned into a video about that discovery. We didn't know what the story would be, however, or how it would tie the subject to the situation. We had some ideas (to do with paleogeoengineering, and previously undiscovered dimensions to the sophistication of the 'Hohokam' civilisation). But the process we went through during those three days proved a surprisingly successful compression of experiential scenario production, albeit one oriented at least as much to history as to the future, which for us was also a bit of an experiment. In film (at least Hollywood narrative feature film), there is generally a progression from general to specific through the following steps: treatment, story, script, film. Getting the story right generally means at some stage fairly early on writing out a treatment of some sort – but a statement of the state of the world, and how we got from here to there. I won't attempt here to map experiential scenario production on to this model exactly, but what it illuminates I think is that there's a nested series of increasingly detailed and reality-like (simulacral) representations, bridging the 'experiential gulf' so to speak (see dissertation Ch. 2), and the whole design involves a lot of running up and down the 'ladder of abstraction' (or across the bridge, perhaps? ), tying the broad premise of the scenario to the details of the experience or interaction that they (the 'audience') have, and that you and your co-conspirators, the producers of the experience, can feasibly produce. What is the role of 'making' in your work? That said, aspects of the ethos of making – proactive experimentation through prototyping; action learning – are at the broadest level among the main reasons for producing experiential scenarios in the first place. Not to be too cute, but 'making' parts of possible futures to see what they feel like and what you can learn by doing so, is a central rationale for this whole strand of work. What is the role of 'story' in your work? Do you think that stories play a significant role in helping people understand possible futures? The role of story is critical in futures at large, but I think it is hugely undervalued. Many in the profession seem to be so keen to bolster their credentials in terms of analysis and plausibility (understandably, against the backdrop of a dominant scientific/managerial paradigm) that the fundamentally narrative and interpretive qualities of foresight work risk being sacrificed to these other concerns. The result is as simple as it is unfortunate: overwrought, poorly told, uninteresting and unimpactful storytelling – the fundamental problem with which is that it doesn't recognise itself as storytelling. There are fewer really good storytellers in the field than you might expect. To put it another way, I suspect one of the main reasons for the field's lack of mainstream impact is that it has not properly recognised and cultivated narrative craft, and as a result most scenarios are appallingly written/constrcted stories with correspondingly 'low yield' (a great term borrowed in this context from GBN cofounder Jay Ogilvy). The language is unsettled: it's a newish thing, and that's the way newish things are. I have views about the terms some of which I've shared above, but the main thing I identify as is a futurist who is trying to extend or raise the rigour, creativity, visibility and impact that this strain of work can have. Whose work in your field do you particularly admire? Do you have any favourite projects or practitioners? Who has influenced your work? The chief advocate for futures-type work and design coming together has been Bruce Sterling. Bill McDonough and Bruce Mau have both influenced my uptake of 'design' as broadly construed by both of them. My favourite projects are the New York Times special edition, perhaps superseded by the post-revolution Tunisia project. The greatest influence of an academic futurist on my work has been Jim Dator. My most influential discussions with colleague collaborators have been with Jake Dunagan, and our sometime design collaborator Matthew Jensen (then Chief Creative Officer of Natron Baxter Applied Gaming). Erika Gregory (formerly of GBN), Jason Tester (formerly of IFTF) and Jane McGonigal (IFTF) have all done great work previously or concurrently to my own experiments into this area. I have enormous interest in the films of Neill Blomkamp (District 9 plus various amazing short films), Michael Winterbottom (Code 46, etc) and above all Peter Watkins (The War Game, Punishment Park, Gladiators etc) for their use of diegetic, documentary-like storytelling techniques evoking putative futures or alternate worlds as real. What do you see as the most significant challenges facing practitioners of strategic foresight, futures studies, and scenario planning today? The futures field has been around for about half a century, but in my view has not had the mainstream impact that it should have by now. In practical terms, I find it illuminating to consider the tensions between psychology of what often attracts people to work in the field (fascination with the new, in many cases) with the formation of an effective field, in terms of community or praxis (which requires some degree of interest in and patience with what has come before). The square wheel is constantly being reinvented by would-be futurists (Jake Dunagan's observation), which represents a vast amount of wasted effort; maverick thinkers seem to have a hard time pooling their efforts, acknowledging their predecessors and peers. And the same personality type produces independent practitioners whose efforts can get easily attenuated into ineffectiveness, because no one is equally good at all three of product, sales, and finance (to borrow a broader insight about business from Ernesto Sirolli). To come at it another way, these key functions and offers are most effectively marketed by people who necessarily don't do them well at the level of substance. Breaking this cycle involves luring a wider audience into deeper contemplation of the future. This is a large part of the rationale for emphasising design and storytelling in futures work: make it compelling. 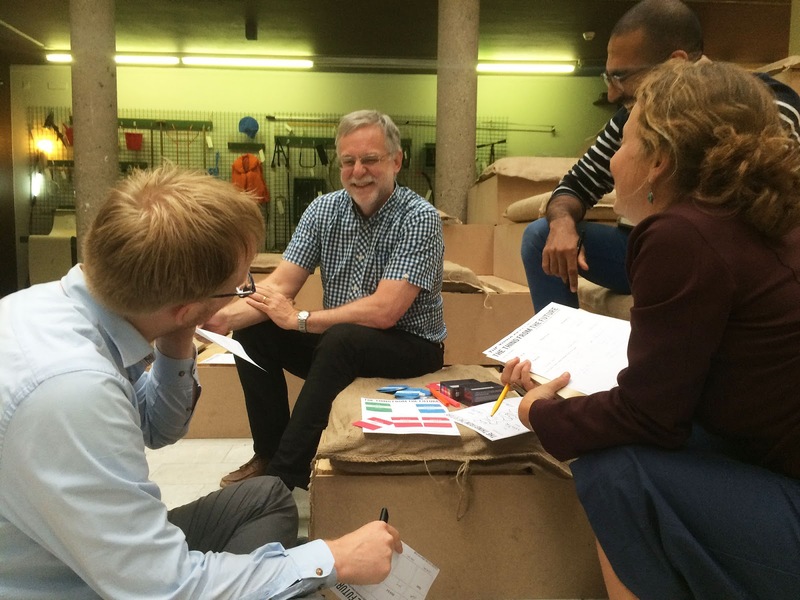 Do you think it is more important for foresight and scenario planning practice to be defined by rigor, or vigor – controlled and scientific use of methods, or active freeform engagement with new audiences and stakeholder groups? You need the latter in order for the former to matter.